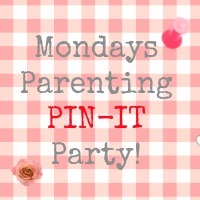 Whoop whoop party pinners, it is time for another parenting pin it party and this week I am hosting, hooray! I know we are a little bit earlier than scheduled but due to immovable commitments tomorrow I decided to get this party started today! I shall, of course, be checking and pinning throughout the week as usual though. This week I get to choose my two favourite posts linked up to last weeks party. It was not easy but I have finally decided on these two fantastic entries. The first is a lovely little tale from Ma Puce who tells us how her love for shoes began. It is a really sweet tale over at Mother, Wife, Me. You can find this here. The second is a lovely apple craft, perfect for autumn, which is great for fine motor skill development in littlies. Really simple but really cute. You can find this over at The Jenny Evolution here. So a huge thank you to our featured pinners. We do hope you will link up again this week and we have even made you a special badge should you wish to display it. Now let’s get this weeks party started! 4. 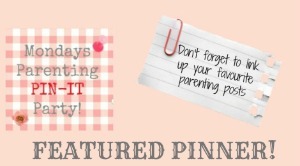 For those Pin-It Party members that comment on your post, try to visit on pinterest and follow at least one of their boards. This way everyone should hopefully gain some new followers themselves whilst discovering lots more cool stuff to pin and like-minded pinners to follow. It is all about sharing the pin-tastic-love people! And now, the magical linky-list awaits. Lets get pinning peeps! Linked up for the first time here, looking forward to visiting some new blogs! Thanks so much for making Ma Puce’s first My Life In Shoes post a featured post, we are both very chuffed!! I’ve linked the second instalment for this week – did try to think of another post, but I went a bit Halloween crazy last week, so it was the most appropriate! Thanks for hosting, I do love this Linky! Looking forward to some more great entries this week! First linky I’ve ever done. This looks like a great one to join. Hoping to find some good reads out there.